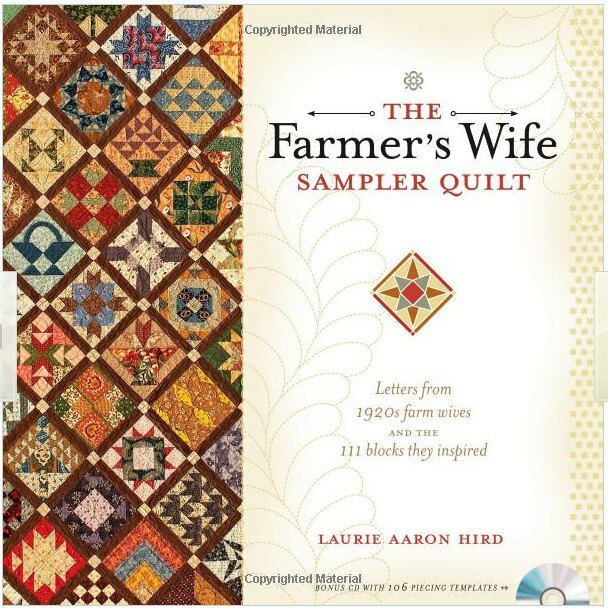 At guild this month, our program was by Laurie Hird, author of The Farmer’s Wife, a quilt pattern book. I think occasionally that I should make a quilt from this book. With the whole farmer’s wife theme going on. I haven’t jumped yet since my Dear Jane quilt remains unfinished. *sigh* I was just talking today to one of Phil’s cousins about DJ and it makes me miss working on that. 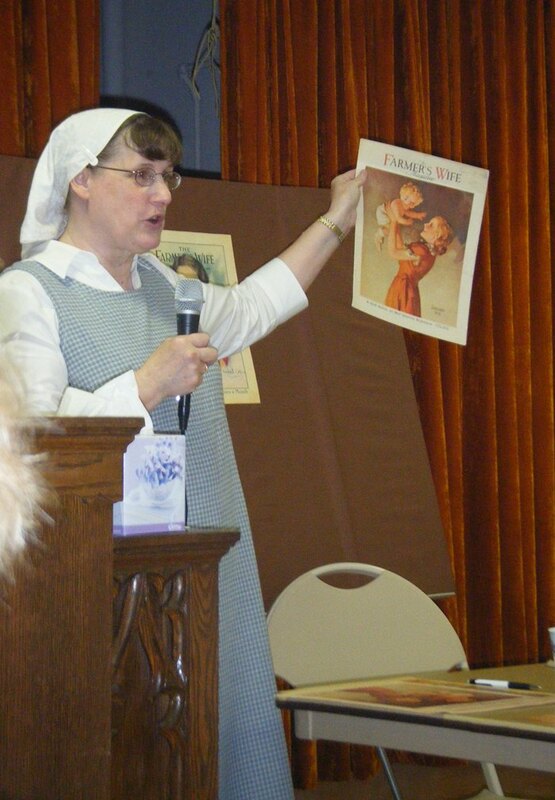 Laurie Hird was a great speaker and we are blessed that she doesn’t live too far from us. 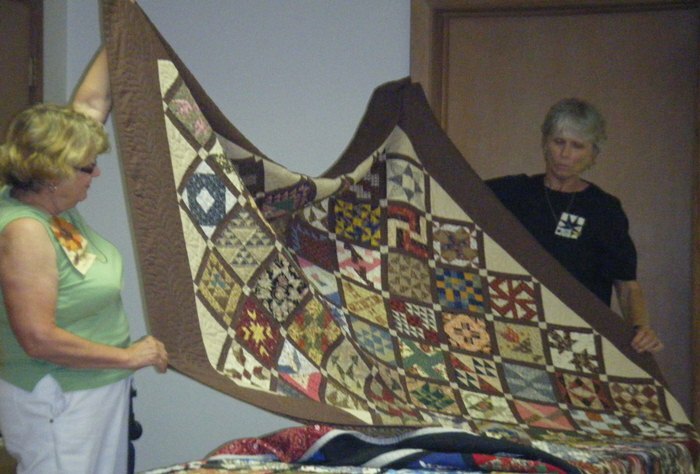 She showed her original FW quilt and also her Pony Club quilt. That book is due this fall. I have NO desire to do that as I have not one inkling towards ponies. At least that is off the hook! 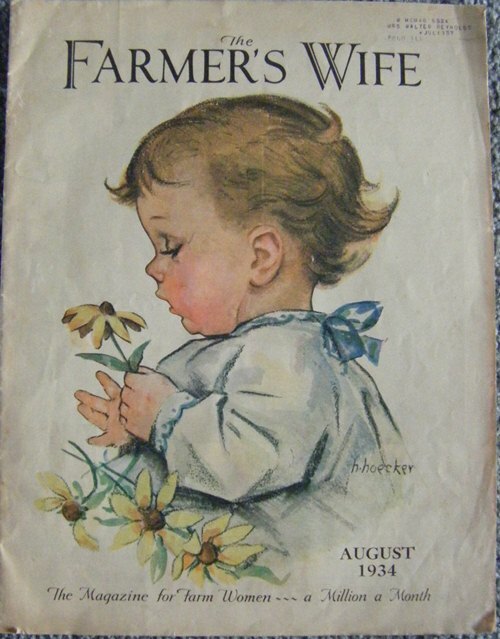 She explained about the FW book and how she based the block designs around letters written to the Farmer’s Wife magazine that was published from the late 1890’s through the 1930’s. She showed many of the original magazines and then some cover posters she’s had printed. She thinks she has the largest personal collection of the magazines. 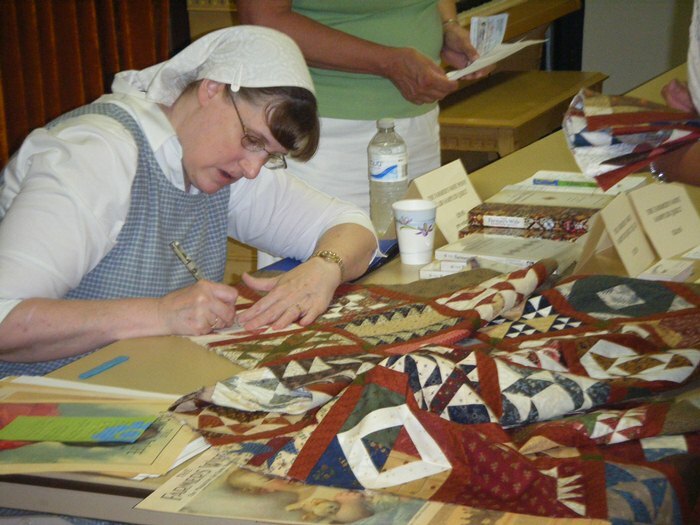 During the break, many who are making the Farmer’s Wife quilt brought either a label for her to sign or had her sign the signature block on their quilt! She was quite kind in doing this as well as posing for photographs with those who had brought their quilts. Here are a few of them. It was hard to get them all in the camera AND they never stood still!! I had borrowed MIL’s blue cross-stitch quilt for show & tell, so returned that to them on my way home. I told them about the meeting and asked if they remembered their parents getting the Farmer’s Wife magazine. They didn’t remember that one but MIL sort of had a thought process going on and she said she’d check her stash. This is the August 1934 edition in mint condition!! It is addressed to Phil’s great-grandmother. He has always spoken highly of this one. While I flipped through the magazine, I read some excerpts to JP. Very funny! He laughed at some of the ads as well. I’m so thrilled to have this magazine and would like to frame it somehow but also be able to see the magazine as well. 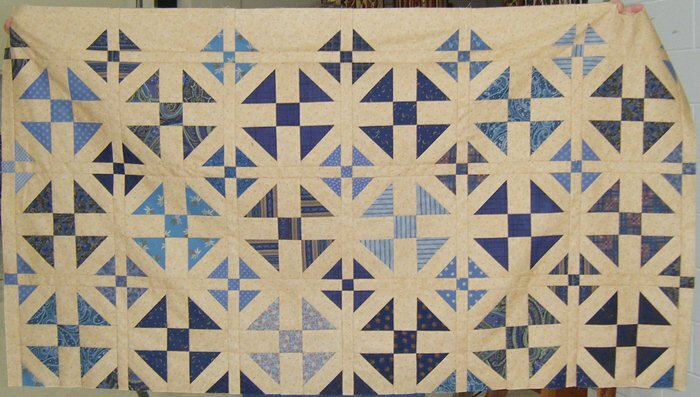 Have you made this quilt or do you have one in process? Do you have any of the magazines that need a new home? The July pattern for the LaPetité group is George by Rosie of Schnibbles fame. George in the Curious George sort of Monkey Wrench block pattern sort of way. A stretch but a cute one. This is the pattern cover. 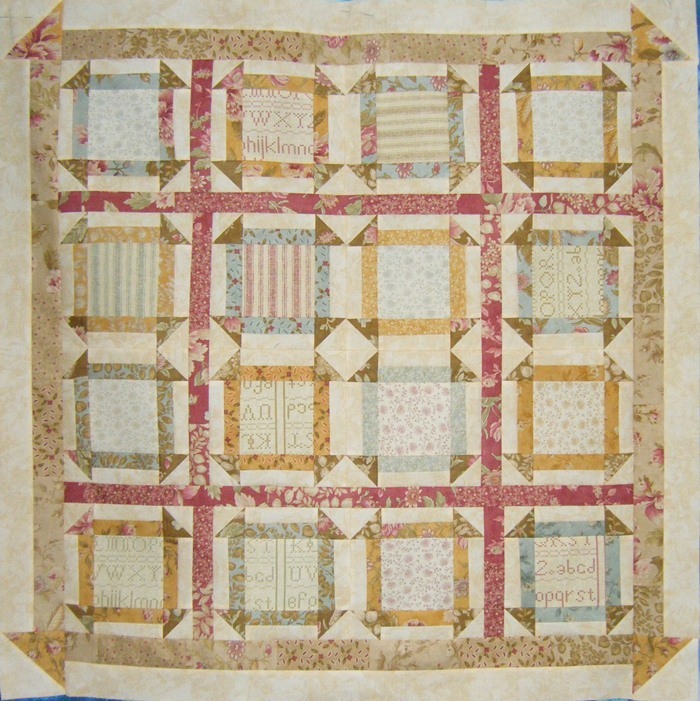 I used the charm packs Wild Rose by Blackbird Designs that I bought in Prairie du Chien, Wisconsin in the spring. I also have a border fabric purchased that coordinates but there was no place for it here. Sort of bummed I didn’t use it but I’m thinking of another plan for the fabric as I really like it! It isn’t quilted yet (but all my other months but December ARE quilted and bound!! 🙂 ) but it is next. I have a customer quilt on the frame now and should finish that soon but not sure I’d have that and this done by the end of the month. I like my fabrics but not sure I’m thrilled with how they work in this pattern. It will have a piece of the blue for the binding. 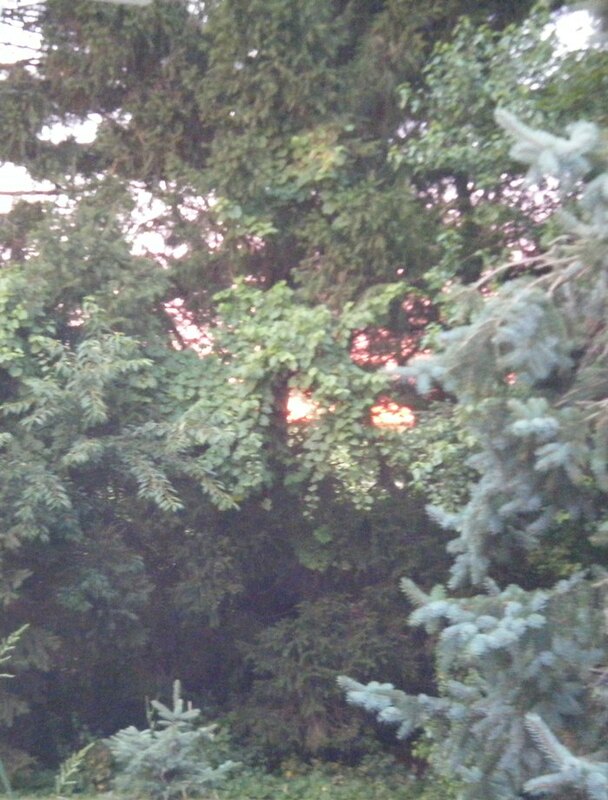 I like the pinks in the sashings. I nearly had a heart attack after I had chosen my 12 (and only) charms for the sashings as the pattern listed. Then I needed 4 more to get the strips long enough before cutting. However, after cutting I had lots of pieces leftover so was thankful I didn’t have to insert blues with the pink. But ARGH! on the pattern error that gave me a pause. I’m glad it all worked out. Is it just me or did you have a problem too? 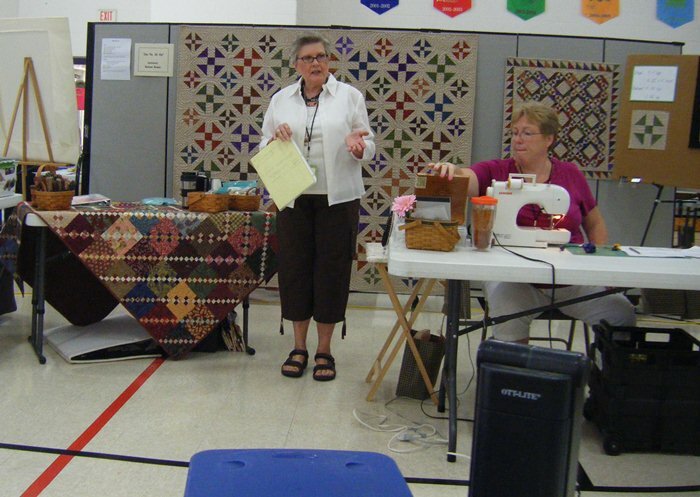 I had 4 students in my summer sewing classes. We had 3 weeks to meet in June & July but had fun in the short amount of time. Since there were 2 brand-new students, we started the first class with a review of the parts of the machine and sewing on paper. Then we made pillows and they each got to choose their fabric from a selection I had gotten out for them. 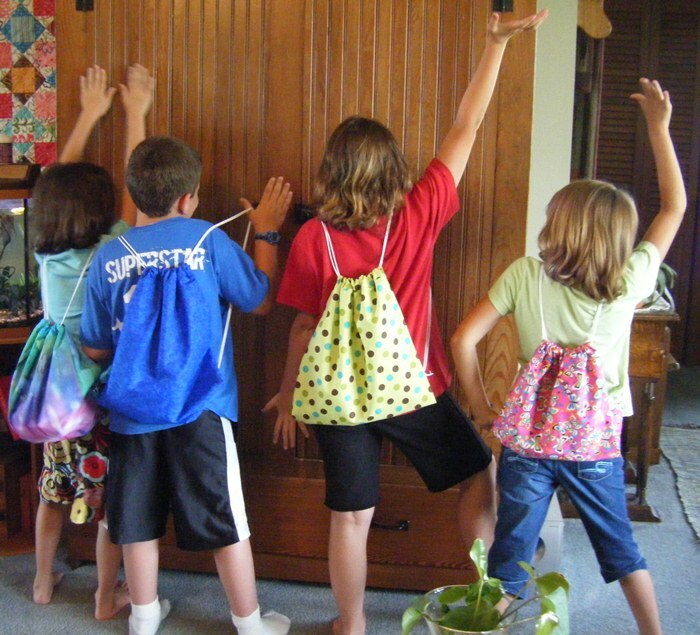 At the 2nd & 3rd classes we made backpacks. A separate casing for the drawstring, threading that through, interfacing to reinforce the corners, grommets, and their cute purchased fabrics. We had enough time on the last day to make little coin purses for inside with a velcro closure. As the last few minutes of class came to a close, Phil asked if they were done and if he could bring something up to show. A 2 hour old baby pig! Quite fun for them!! As the moms came back for pick-up, I met them outside and let them know about the baby pig so they could bring in the littles in their car. So much fun! 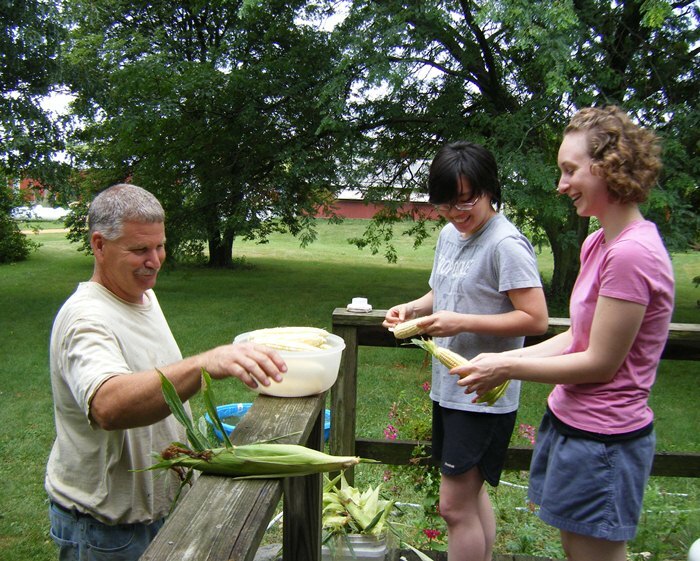 Her friend, C, is from Singapore and was excited to visit a farm. I wondered if she had seen any more of the US than Chicago. She said she had been to Milwaukee once and flown to New Hampshire with a friend. 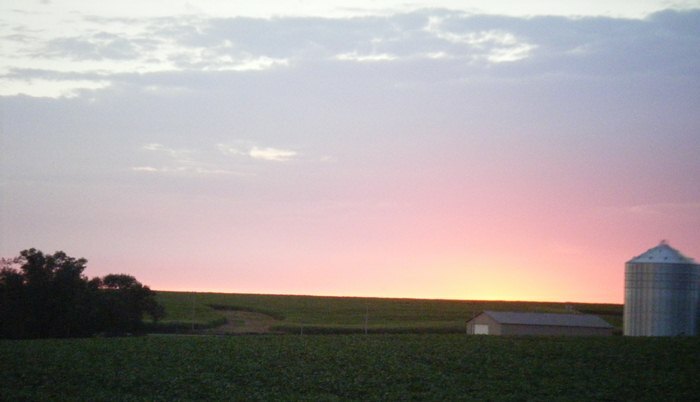 So… we showed her another side of Illinois and took a quick jaunt into Iowa for her. She is just delightful! The next morning after our blessing of RAIN 🙂 🙂 🙂 settled, the girls toured the farm. I stayed in and loaded a quilt. 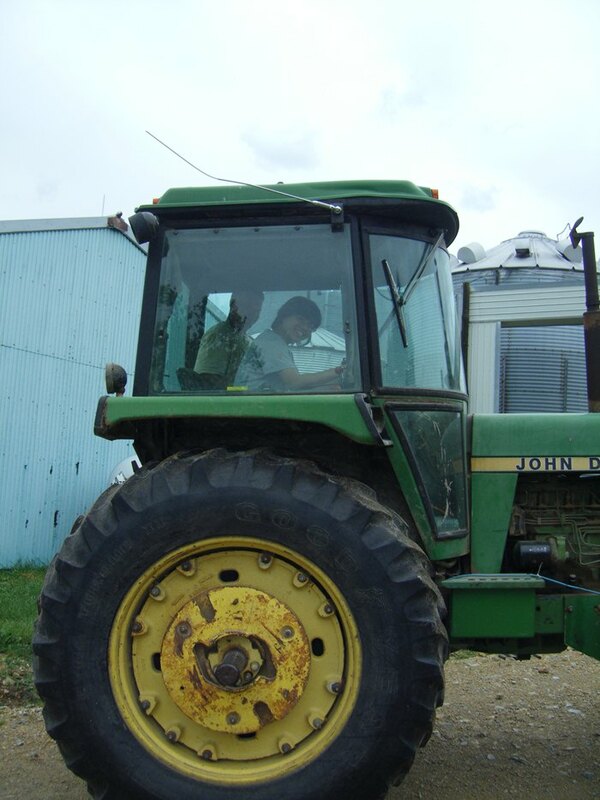 C has never had a driver’s license (here or there) but Phil let her drive the tractor. Around and around and around the loop. 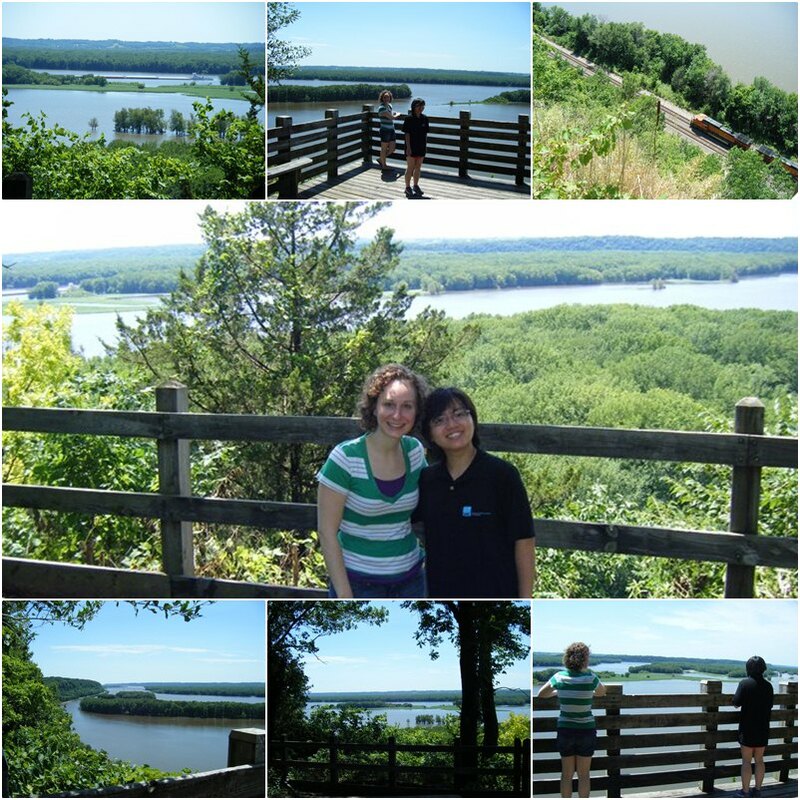 After lunch, C was quite interested that the Mississippi River was just 25 miles away so we took a quick road trip to our usual look-out. Along the way we gave her a tour of our town (LOL on the “downtown”) and she was amazed at how big the houses were. We delighted in pointing out the population signs for each town. We showed her the ONE stop light in our county and then headed up along the river to the good scenic place. Along the way C commented that the river was much bigger than on the map. 🙂 She is just so cute like that! We were treated to a train passing underneath the look-out and a barge going by on the river. C’s dad does some type of work with tug boats so that was fun for her to see here in America. After a quick cross to Iowa and a visit to an office store, I treated to Culver’s. She was perplexed at the turtle sundae idea but loved it. K & C enjoyed sharing my cheese curds, too. We had an early supper and they had to head home for K’s job today. C loved her visit she said and we hope she can manage to come back even with starting a job next week. 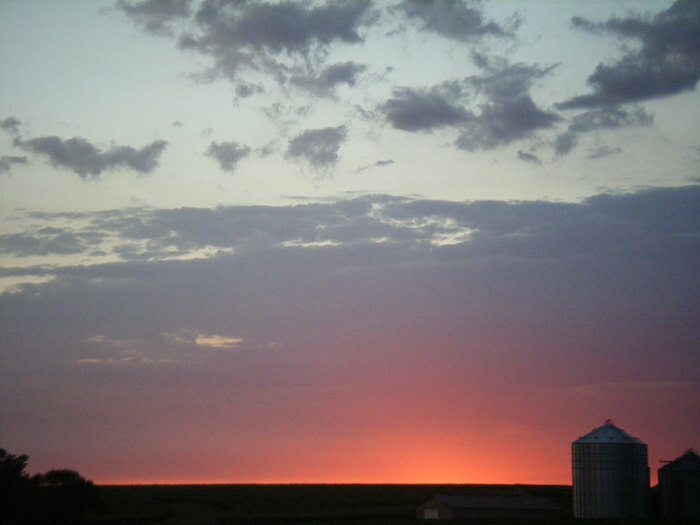 Last night while waiting for JP to come home from worship team practice and K & her friend C to come for an overnight visit… all the sky was lit with this beautiful sunset! 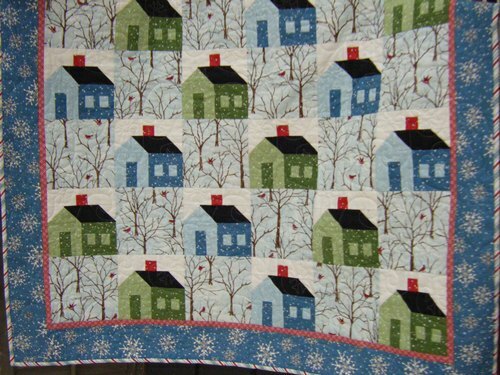 E & I LOVED this quilt and would like to make smaller versions of it. Maybe a 3 x 3 setting with 5 pieced houses. So….. we left here VERY early at 6:35 a.m. on Saturday so that we could go to the sponsoring quilt shop. At the retreat site, they had a bit of “store” but only had this in kit form which we didn’t need. The shop opened at 7 for retreaters and we were given a 20% discount so wanted to enjoy that for the day. We got there around 7:40. However, amongst the whole fabric line was NO bolt of the background tree print. The part we loved the most!! 😦 E needed backing for another quilt so got that. Imagine this…. I left w/o buying!! 🙂 Phil won’t believe it either! I’ll either look online or check the shop in September or admit that I won’t get it made for a Christmas present anyway and give it up. The retreat site opened at 8 and we got there about 8:20 and got back to sewing. Class was officially back in session at 9. Here is a collage of a samples from each class besides ours. You can click the photo to see if bigger if you need. The class shown on the top had most of their work done by Friday evening! Some started a second quilt on Saturday. It looked like they had done pre-cutting and then had big (12″?) blocks put together quickly. 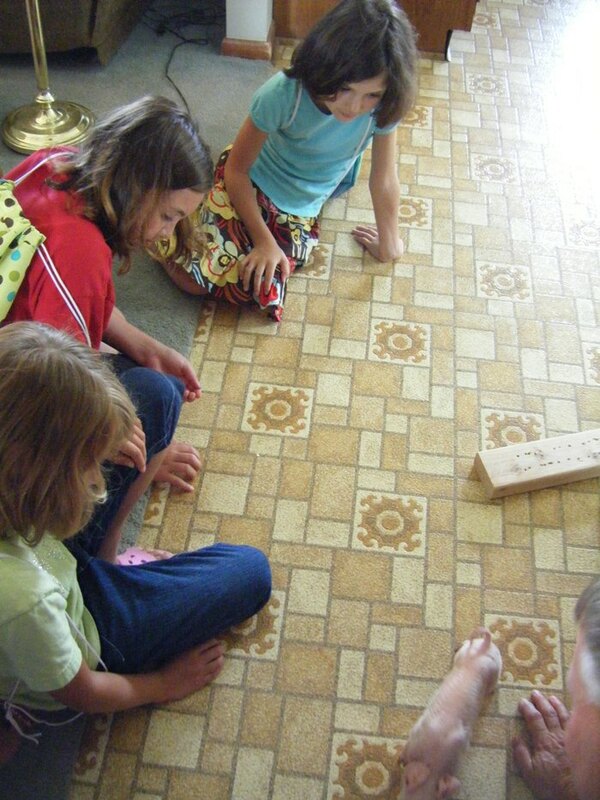 I saw them working on design walls as there are several ways to arrange the block. Cool! 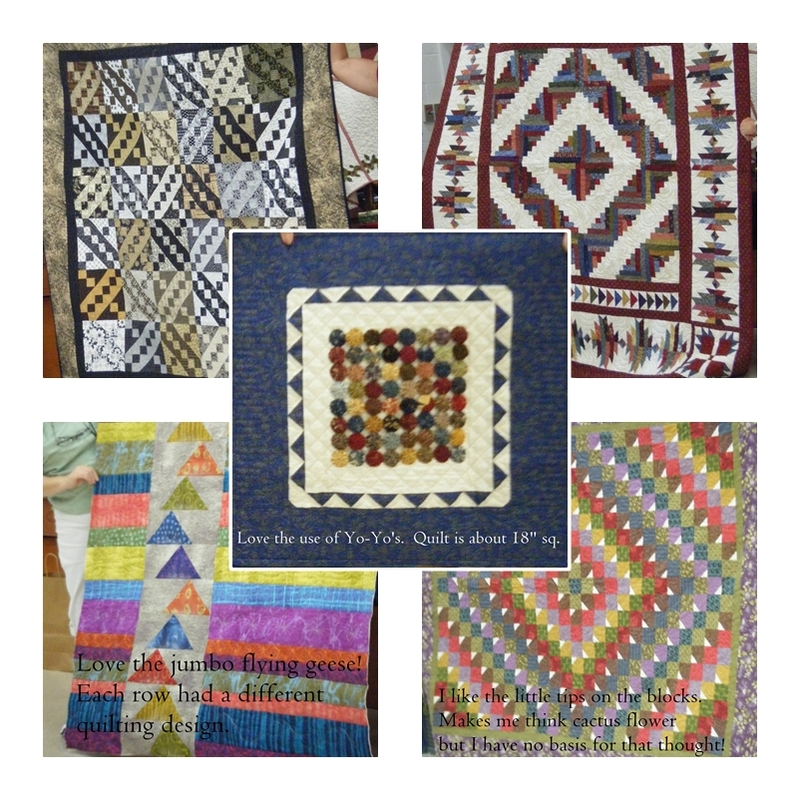 Some of the circle quilts looked all pieced by the time we were heading out. 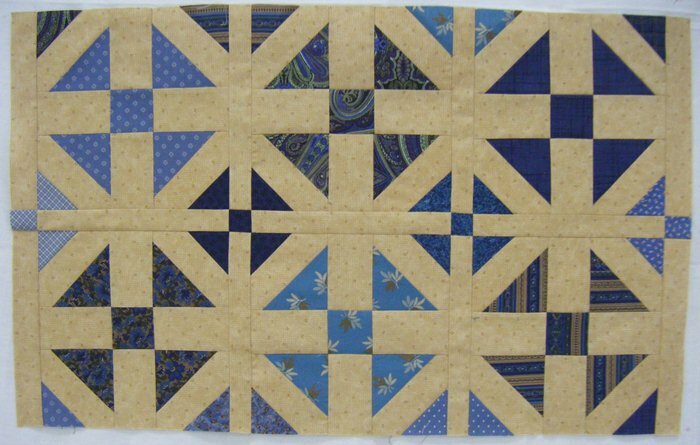 The Farmer’s Daughter (pinks & blues shown) did a lot of piecing as we did and had just started to assemble the tops. The baskets were next to us and several of my guild friends were there. (Note Beth’s pose for me 🙂 I had a shot of 3 tops and then she turned the other way so I complained. I got this in return!! LOL!!) Very cute pattern. 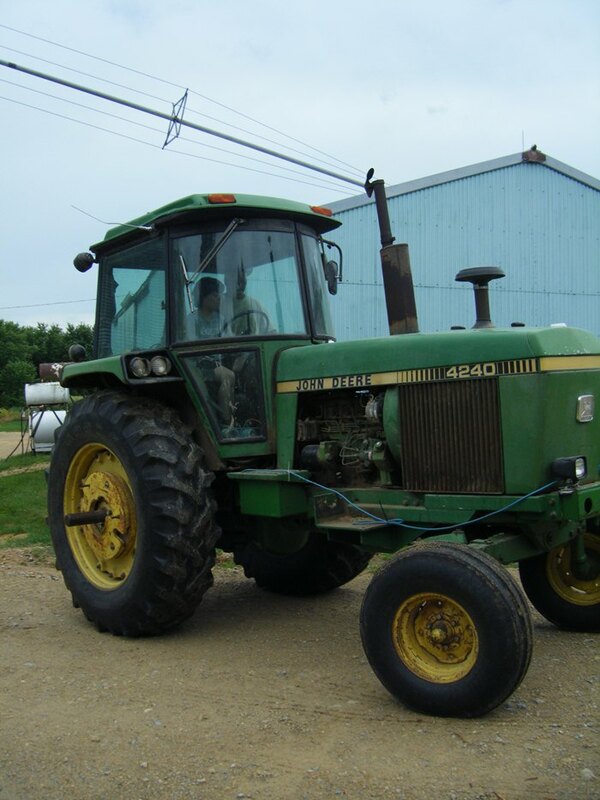 This was our other choice for class. The setting was a gym at a Christian school and it was just perfect!! The room was divided into the 5 classrooms w/ moveable walls. Each area was made just the right size for each class. Then a larger sitting area w/ round tables for our meals. This is Barbara, our teacher, getting us started on Friday morning. She was very nice and helpful. It was cute that each teacher decorated their teaching desk and had little perks for us. 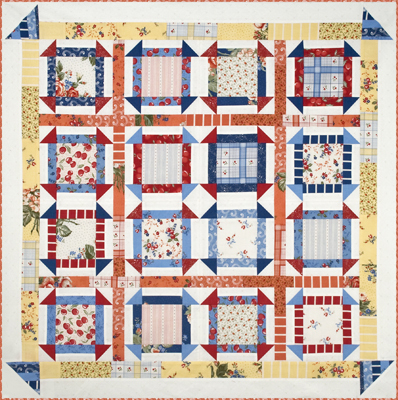 Barbara had a basket with basic quilting tips written out on paper. Throughout the 2 days, each student would read a tip, then share one of their own tips, and she’d let us choose a fat eighth from her basket. 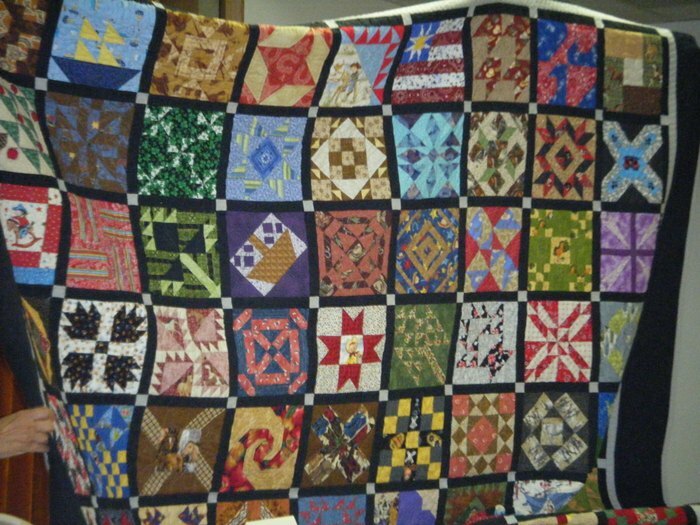 Across the stage was the ‘store’ and these quilts were on display for upcoming BOM’s. Show & Tell of other projects was after lunch on Saturday. That information wasn’t in our packets so we didn’t know to bring items. Here is a sampling. We got a bit more time for sewing after this. I was at a good stopping point and once Elinor got to one, we packed up and headed out. We were home just before 4. E had dinner with some friends that evening and I have company today so it was good to be home at a decent time. I had a great time at the quilt retreat and finished 3 of 7 rows and 1 border out of 4. We were in the hardest, most challenging, class. 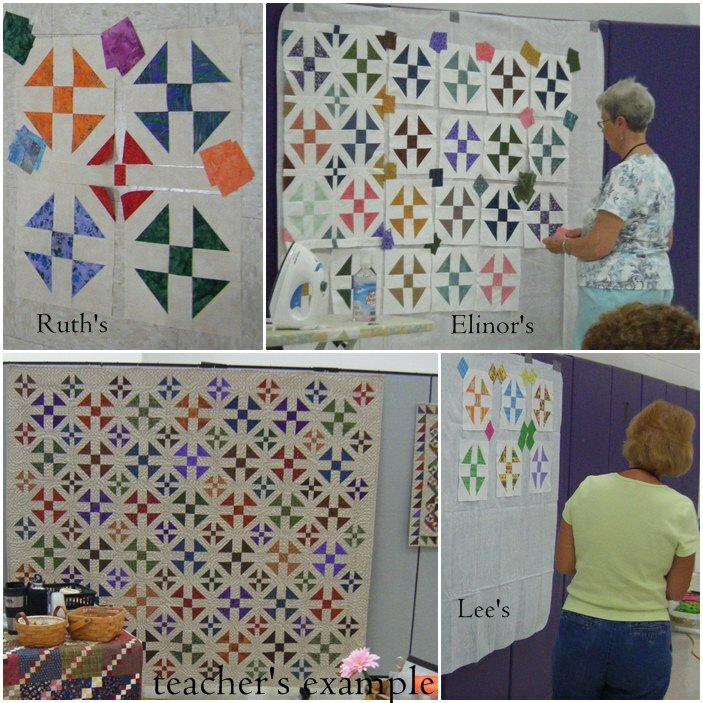 Here are progress photos of my quilt — After we had made some of the regular Shoo-Fly blocks, she taught us about making the mini Shoo-Fly blocks that go between them. This is the OH MY!! part of the pattern. >insert big grin here< Remember that in my PREP, we were asked to have the cutting done and it was a good idea to do step 1? Well, I was the only one of 12 in our class that finished Step 1. Many hadn’t started any of step 1 but everyone had done the cutting. I was glad I had done it. By the end of Friday — we left there about 7:30 to come home as I was tired and wanted good food and rest — I had 6 blocks together with their sashing, shown above. 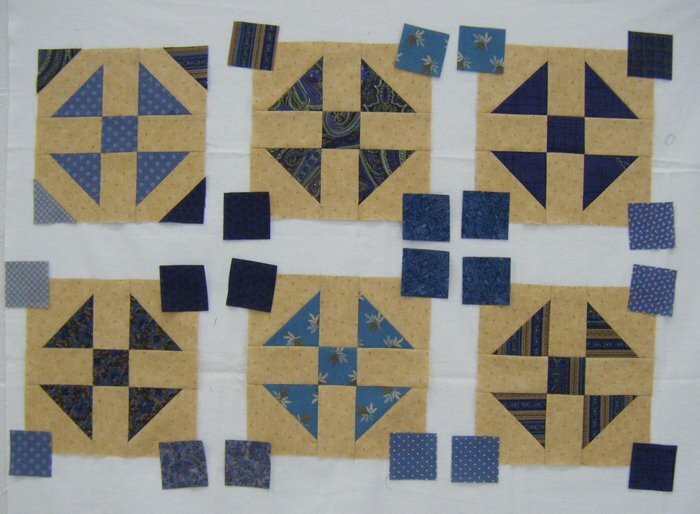 This morning I added the rest of the blocks to complete rows 1 & 2 and made the top border which completes the little Shoo-Fly blocks. I love the outer border touch!! After lunch, I added a third row. There are 7 rows all together. I probably need to make about 10 more blocks and then will go back to assembling them in rows. (The color of background is more of the buttery cream/tan in the first 3 photos.) 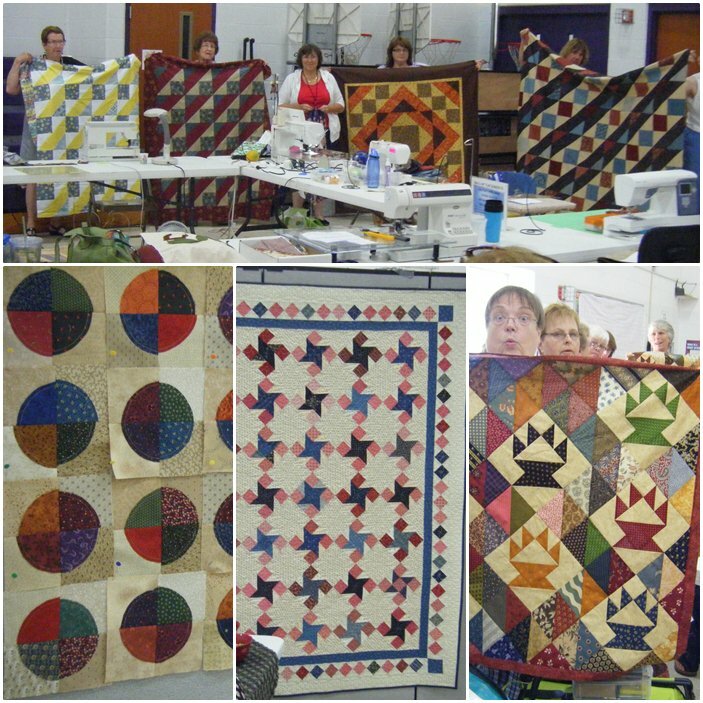 Here are some other quilts from our class group — It is always fun at classes to learn from others fabric choices. I thought I had photos from some others as well but I guess not. When we had show & tell of what we did in class, I was holding my progress, not my camera! E & I sure enjoyed the days together and the ride back & forth was fun with her along. We plan to go back next year and hope some other friends can join us. I have other photos that I’ll try to share later. To leave a comment, scroll to the end of the post. There you will either see "Leave a Comment" or "a number Comments" in green. Click there and the comment box will open (at the end of the post) and allow you to type there. You don't need to fill in all the info boxes so only do as you wish.